Matching Ties is Paul Stowe and Trevor Morriss. They're a dynamic, highly engaging duo from Germany, although Paul is American and Trevor is British. These guys put on a show to remember. 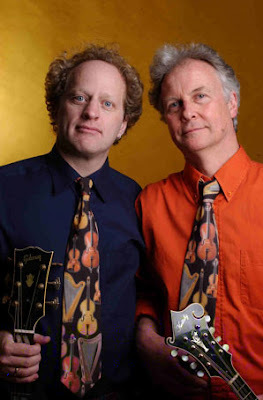 They've worked together as a duo, a trio with a bassist, a quartet with a fiddler across Europe for over 20 years. I guess you could say they're "audience tested." Come enjoy a full evening of Irish, British and related American folk, bluegrass and acoustic blues with Trevor Morriss from London, GB on mandolin, Irish bouzouki, guitar and vocals, and Paul Stowe on acoustic guitar and vocals. If you would like to know more about Matching Ties, visit www.matchingties.com.